This invention provides the use of a silicone-based transdermal therapeutic system having an area of 10 to 40 cm2 and containing 0.1 to 3.15 mg/cm2 of Rotigotine as active ingredient, for the preparation of an anti-Parkinson medicament which effects an improvement, compared to a placebo treatment, of the condition of human Parkinson patients, measured according to the Unified Parkinson's Disease Rating Scale (UPDRS) parts II and III, of 2 units or more following administration for a time period of at least 7 weeks. To date, various transdermal therapeutic systems (TTS) for the administration of rotigotine have been described. 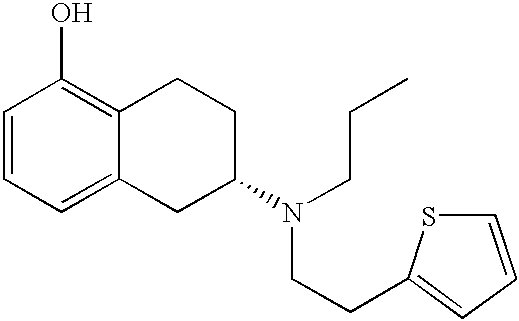 WO 94/07468 discloses a transdermal therapeutic system containing rotigotine hydrochloride as active substance in a two-phase matrix which is essentially formed by a hydrophobic polymer material as the continuous phase and a disperse hydrophilic phase contained therein and mainly containing the drug and hydrated silica. The silica enhances the maximum possible loading of the TTS with the hydrophilic salt. Moreover, the formulation of WO 94/07468 usually contains additional hydrophobic solvents, permeation-promoting substances, dispersing agents and, in particular, an emulsifier which is required to emulsify the aqueous solution of the active principle in the lipophilic polymer phase. A TTS, prepared by using such a system, has been tested in healthy subjects and Parkinson patients. The average drug plasma levels obtained by using this system were around 0.15 ng/ml with a 20 cm 2 patch containing 10 mg rotigotine. This level must be considered as too low to achieve a truly efficacious treatment or alleviation of symptoms related to Parkinson's disease. Considering the rather discouraging experiences made with the silicone formulation of WO 94/07568, the acrylate-based TTS of Example 1 of WO 99/49852 has been subjected to clinical tests (safety and pharmacokinetic studies). The mean steady flux rate across human skin in vitro of this TTS amounted to 15.3 μg/cm 2/h. However, it turned out that the plasma levels obtained using this TTS were still unsatisfactory and too low to allow for a really efficacious treatment of Parkinson's Disease. A 30 mg (20 cm2) patch only yielded a mean maximum plasma concentration of 0.12 ng/ml, while a 5 cm2 patch containing 7.5 mg yielded a mean maximum plasma concentration of 0.068 ng/ml. Again, such values have to be considered as too low to provide a real therapeutic progress in the treatment of Parkinson's Disease. Thus, in summary, both the 20 cm2 silicone patch of WO 94/07468 and the 20 cm2 acrylate patch of WO 99/49852 failed to evoke sufficient drug plasma levels to provide a satisfactory therapeutic effectiveness. In view of these experiences, it has been very surprising that a transdermal therapeutic system containing rotigotine in free base form in a silicone matrix could not only provide unexpectedly high plasma levels of rotigotine but also a significant therapeutic progress in the transdermal treatment of Parkinson's Disease. In particular, it has been unexpected that a transdermal therapeutic system having a size of as little as 10 or 20 cm 2 could provide for an effective treatment of Parkinson's Disease in a placebo-controlled clinical study, as indicated by an improvement in the Unified Parkinson's Disease Rating Scale (UPDRS) of 2 or more compared to a placebo treatment. In the context of this application, “placebo treatment” refers to a treatment with a transdermal therapeutic system of identical qualitative composition and according to the same therapy regimen but where the active ingredient (rotigotine) in the transdermal therapeutic system has been omitted. The present invention provides the use of a silicone-based transdermal therapeutic system having an area of 10 to 40 cm 2 and containing 0.1 to 3.15 mg/cm2 of Rotigotine as active ingredient, for the preparation of an anti-Parkinson medicament which effects an improvement, compared to a placebo treatment, of the condition of human Parkinson patients, measured according to the Unified Parkinson's Disease Rating Scale (UPDRS) parts II and III, of 2 units or more following administration for a time period of at least 7 weeks, preferably at least 11 weeks. In a particularly preferred embodiment of the present invention, the transdermal therapeutic system has a surface area of 10 to 30 cm 2, more preferably 20 to 30 cm2. It goes without saying that a TTS having a surface area of, say, 20 cm2 is pharmacologically equivalent to and may be exchanged by two 10 cm2 patches or four 5 cm2 patches having the same drug content per cm2. Thus, the surface areas as indicated in this application should be understood to refer to the total surface of all TTSs simultaneously administered to a patient. A preferred content of rotigotine per patch is in the range of 0.1 to 2.0 mg/cm 2. Still more preferred are 0.4 to 1.5 mg rotigotine per cm2. If a 7 day patch is desired, higher drug contents will generally be required. A rotigotine content in the range of about 0.4 to 0.5 wt % has been found to be particularly advantageous in that it provides the optimum usage of the drug contained in the TTS, i.e. there is only very little residual drug content in the TTS after administration. The apparent dose administered by using such a TTS usually is 50% or more and may be as high as 80-90% of the drug amount originally contained in the TTS. The fact that the silicone-based transdermal therapeutic system described in this invention is able to provide a significant therapeutic effect against symptoms of Parkinson's Disease even at surface areas of 10 to 30 cm 2 and particularly as little as 10 or 20 cm2 and at low drug contents of about 0.4 to 0.5 mg/cm2, particularly about 0.45 g/cm2, must be considered as a further particular benefit provided by the present invention. In a further aspect, this invention relates to a method of treating Parkinson's Disease by applying on a patient in need thereof a silicone-based transdermal therapeutic system having an area of 10 to 40 cm 2 and containing 0.1 to 3.15 mg/cm2 of rotigotine as active ingredient, the improvement wherein is that the condition of the patient, measured according to the Unified Parkinson's Disease Rating Scale (UPDRS) parts II and III, is improved, vis á vis placebo treatment, by about 2 units or more over a time period of at least 7 weeks administration. Maintenance of this UPDRS score improvement for up to 7 weeks has been shown as well. Thus, improving the UPDRS (parts II+III) score over placebo by at least 2 units following administration for 7, preferably 11 weeks forms a particularly beneficial aspect of the present invention. The abbreviation FAS stands for “Full Analysis Set” and thus designates an analysis including all patients who were included in the study. The UPDRS score and the study design is explained in more detail in the Clinical Trials Example below. FIG. 1 is a graph illustrating the mean change from base line in UPDRS (II+III) total scores from day 0 to end of treatment in this study. This figure compares the effects of a treatment according to the present invention with a placebo treatment. Statistically significant improvements can particularly be observed for patches having an area of 20 cm 2 or more, though even the effect of the 10 cm2 patch must be considered as an improvement. The value indicated as p in the above table represents the one-sided p-value obtained from a statistical evaluation of the trial data. The invention and the best mode for carrying it out will be explained in more detail in the following non-limiting examples. (−)-5,6,7,8-tetrahydro-6-[propyl-[2-(2-thienyl)ethyl]-amino]l-naphthalenol hydrochloride (rotigotine hydrochloride, 150 g) was added to a solution of 17.05 g NaOH in 218 g ethanol (96%). The resulting mixture was stirred for approximately 10 minutes. Then 23.7 g of sodium phosphate buffer solution (8.35 g Na 2HPO4×2H2O and 16.07 g NaH2PO4×2H2O in 90.3 g water) was added. Insoluble or precipitated solids were separated from the mixture by filtration. The filter was rinsed with 60.4 g ethanol (96%) to obtain a particle-free ethanolic solution of rotigotine in the form of the free base. The dispersion was coated onto a suitable polyester release liner (SCOTCHPAK® 1022) with a suitable doctor knife and the solvents were continuously removed in a drying oven at temperatures up to 80° C. for about 30 min to obtain a drug-containing adhesive matrix of 50 g/m 2 coating weight. The dried matrix film was laminated with a polyester-type backing foil (SCOTCHPAK® 1109). The individual patches were punched out of the complete laminate in the desired sizes (e.g. 10 cm2, 20 cm2, 30 cm2) and sealed into pouches under the flow of nitrogen. The following table shows the composition in mg/20 cm 2 of a transdermal therapeutic system according to the present invention containing a combination of two silicone-type PSA. 1. The use of a silicone-based transdermal therapeutic system having an area of 10 to 40 cm2 and containing 0.1 to 3.15 mg/cm2 of rotigotine as active ingredient, for the preparation of an anti-Parkinson medicament which effects an improvement, vis á vis placebo treatment, in the condition of a human Parkinson patient, measured according to the Unified Parkinson's Disease Rating Scale (UPDRS) parts II and III, of 2 units or more following administration for at least 7 weeks. 2. The use according to claim 1 wherein the silicone-based transdermal therapeutic system comprises two or more silicone adhesives as the main adhesive components. 3. The use according to claim 1 or 2 wherein the silicone-based transdermal therapeutic system further includes a solubilizer. 4. The use according to claim 3 wherein the solubilizer is polyvinylpyrrolidone. 5. The use according to any of the preceding claims wherein the silicone-based transdermal therapeutic system contains less than 1 wt % of inorganic silicates. 6. The use according to claim 5 wherein the silicone-based transdermal therapeutic system is free from inorganic silicates. 7. The use according to any of the preceding claims wherein the transdermal therapeutic system has an area of 10 to 30 cm2. 8. The use according to any of the preceding claims wherein the transdermal therapeutic system contains 0.1 to 1.5 mg/cm2 of rotigotine. 9. The use according to claim 1 wherein the transdermal therapeutic system is a patch having an area of 10 to 30 cm2 and a content of rotigotine of 0.4 to 0.5 mg/cm2 in an adhesive silicone-based matrix. 10. In a method of treating Parkinson's Disease by applying on a patient suffering from this disease a silicone-based transdermal therapeutic system having an area of 10 to 40 cm2 and containing 0.1 to 3.15 mg/cm2 of rotigotine as active ingredient, the improvement wherein is that the condition of the patient, measured according to the Unified Parkinson's Disease Rating Scale (UPDRS) parts II and III, is improved, vis á vis placebo treatment, by about 2 units or more following administration for a time period of at least 7 weeks. 11. A transdermal therapeutic system for the treatment of Parkinson's Disease, which has a size of 10 to 30 cm2 and contains 0.4 to 0.5 mg/cm2 rotigotine as active ingredient in a matrix mainly comprising an admixture of at least two amine-resistant silicone adhesives. 12. The transdermal therapeutic system according to claim 11 which contains less than 1 wt % of inorganic silicates. 13. The transdermal therapeutic system according to claim 11 which further includes a solubilizer. 14. The transdermal therapeutic system of claim 13 wherein the solubilizer is polyvinylpyrrolidone. Parkinson Study Group 2003 A controlled trial of rotigotine monotherapy in early Parkinson's disease.